Because I need a good book to read and this sounds interesting. I have business trips planned to 4 different states in the next month and will have plenty of flight time to spend reading. Because I am an action-adventure buff (like Goonies and National Treasure), but who is caged in “inverted Christianity”. This text could give me langauge and courage to chase the Wild Goose more openly, away from the safety of the status quo. Thanks! I think I should get the free book because it would be really funny to send something from 13720 Roe, Office 208 D to 13720 Roe, Office 208 E! I’m sure you have already picked someone, but my reasons are the best. 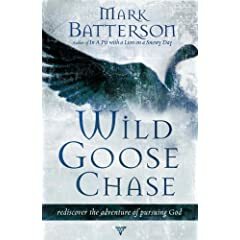 1) I actually attended Mark Batterson’s congregation when I lived in Washington, DC. 2) I went to California for the first time ever this past week. 3) I offered to give Russell the seat on the airplane if only one of us could come back last night when our flight was canceled so he could be POW this morning (but we all got back). Thanks Andrew! I thought others had really good arguments. I apprecaite it!